Don’t replace the hard drive in your new 2011 iMac (s aapl), or the fans will scream like a banshee as they spin up to full-speed and the Apple Hardware Test (AHT) will fail. The issue is that the factory-installed Apple hard drives have a built-in thermal sensor that is connected to the logic board by a proprietary SATA power cable that includes additional pins for the sensor. The Apple drives have custom firmware to send the temperature information to the logic board through this custom connector. Replacing the drive with one that does not run Apple’s custom firmware, or disconnecting the thermal sensor entirely, will unleash the whirling dervishes that are normally held in reserve for when you foolishly decide to run Flash (s adbe) video in Safari. The fans-gone-wild issue and the failed AHT warning is a result of the logic board losing communication with the sensor. Thermal sensors have been included in Macs for as long as I can remember to help the system adjust fan speed to maintain acceptable temperatures. If these sensors do not report any temperature information, the firmware will turn the fans up to full to prevent a core breach in the warp engines, and/or red-hot CPU’s flowing like molten slag all over your pretty blue logic board. It’s a precautionary measure to prevent an overheating problem. The AHT warning is there to tell you which sensor has failed so you can replace it. 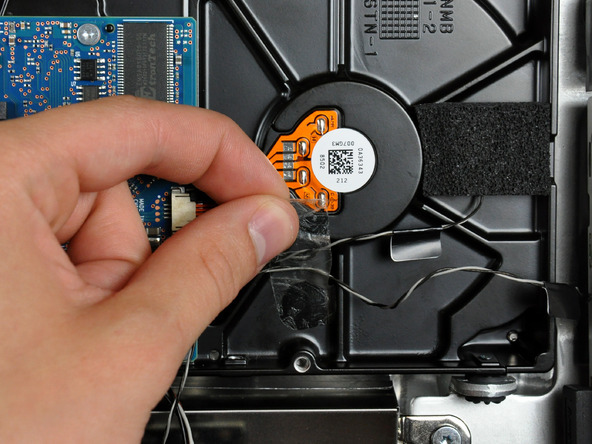 What makes this sensor different is that it is integrated into the custom hard drive. A lot of the earlier thermal sensors were stick-on affairs that attached to the hard drive or other locations with tape. I presume that Apple asked manufacturers to bake them into the drives to reduce both additional component costs and assembly steps. Unfortunately, this change means repairing a failed hard drive out of warranty (I think hard drives are designed to fail just after AppleCare expires) means paying Apple to do it instead of a cheaper DIY solution. This also means you can’t upgrade your drives because Apple will only replace drives with the exact same part. Under their current policies, you simply cannot get a bigger hard drive (or replace it with a SSD) even if you were willing to pay Apple’s prices. You better order your new iMac just the way you want it, because it’s going to stay that way for a long, long time. Even more concerning than the design change to force the use of genuine Apple replacement drives is the absolute travesty that Apple has allowed this design flaw of the iMac to continue for so long. The iMac is the hardest piece of Apple kit to work on yourself on by a long shot. The Mac Pro is designed to be easily opened. MacBooks and MacBook Pros provide easy access to the hard drives and RAM. The new Mac mini has a twist off access panel. Even the old Mac minis are not that bad as long as you have the right putty knife. It’s certainly not as bad as the old iBook (about 50 screws to get at the hard drive! ), but it’s the worst of the current Macs. I don’t even think most people need access to the other components inside the machine, but access to the hard drive is important. The old iMacs were designed so that you could remove the back and get quick access to the drives. 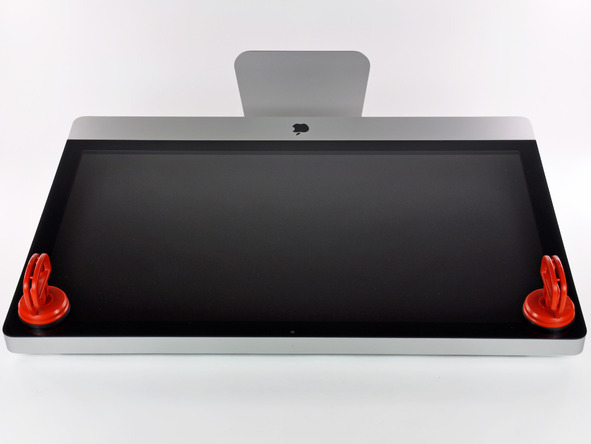 The aluminum iMacs were designed to open from the front so that you have to remove the glass panel (it pulls off with suction cups) and the LCD screen behind it to get to the drives. The worst part is that you often put it all back together only to find a piece of hair or lint or a stray thumbprint on the back of the glass. Takes me straight back to the days when I ran a frame shop and would turn a framed photo back over after papering the back only to find a small piece of dust emerge from the dark suede mats, staring at me from under museum glass like a blazing signal fire warning of imminent customer dissatisfaction or framer’s rage. That glass on the front of the iMac is likely responsible for more referrals to Apple’s generous mental health programs than any other item that has ever sat on a Genius Bar. It does make for a very pretty iMac though. Which is, I suppose, the reason why Apple has kept roughly the same iMac design for so long (since 2007). Maybe the drive could be relocated from where it is now, smack dab in the center of the machine, out to the edge where it could be accessed with a removable panel. But you can’t add an access panel for the drives to the top or bottom because that has to be kept open for the convection cooling airflow to pull air in at the bottom and vent out the top. So maybe, the side opposite the optical drive. But that would mess up the unibody look of the iMac with no visible seams in the aluminum (just the RAM slot at the bottom). Okay, so maybe adding easy hard drive access is too much of a design sacrifice, but now even if you manage to get at the hard drive, you can’t replace it. I have the late 2009 27″ iMac model. I am thinking about upgrading to this newer one because of Thunderbolt. I am a video editor and Thunderbolt will be very helpful for backing up video/audio files. I don’t care whether the internal hard drive is replaceable or not, I use external drives anyways. The solution is simple: Don’t buy one. Doesn’t any internet-geek realize that the majority of Mac users DON’T have a need to access or upgrade their Mac? Wake up! You are NOT an average (i)Mac user, and NOT part of the target audience! the iMac was NOT designed with you in mind, and yes the iMac IS a hot-selling piece of hardware. Agree totally. I have no desire whatsoever to pull apart my iMac — it suits my needs, and if I need extra storage (which right now, with a 1TB HDD, I don’t), I’ll add an external drive. As for HDD’s dying, this is my 5th Mac, and I’ve not had an issue with anything. Maybe it’s all in how someone uses their machine? As far as I know, sales of all Apple products are going well. The take-apart manual for the 2011 SSD equipped iMacs (which haven’t shipped yet AFAIK) indicates an Apple-supplied cap is supposed to go over the sensor pins on the SATA cable. It looks like the cap simply shorts the sensor pins and there have been some reports that doing so yourself will allow replacing the drive with whatever you have handy. OMG… How terrible Apple is. Why I remember, it was just like yesterday, when Apple had the gaul to use USB interface for keyboards, mouse, etc and they even removed the floppy drive from the chassis. What unmitigated gaul. Apple will fold up and close. There is no way that the industry will start putting thermisters on drives so they will be Apple compatible. I’m so glad that someone understood the reference! Didn’t mean to ruin you day though. Sorry ’bout that. There are utils to control the fan speed, altho how they monitor the internal temps and adjust the fans I don’t know. The Hardware Test…well who runs that anyway? The proprietary cable would be the big problem. Looks like an external drive stuck out of sight on the back with velcro is the only option. How about a new support with a drive built-in? Lots of photos published with tacky attachments on the iMacs until Jon Ives shrieks for mercy and forces changes within the Walled Garden. Upgrading to a larger hard drive isn’t the main issue. Replacing a dead hard drive out of warranty is. Specing out an iMac with a larger drive at purchase doesn’t solve this problem. Apple could be using this to force us into buying Applecare. Since that’s a lot more expensive than a new drive (especially at what Apple pays), it could be very profitable for Apple. With the new fast Thunderbolt I/O port the best solution may be to get an iMAC with the smallest SSD option–for booting and programs– and then get a external Thunderbolt HD, as large as possible, for storing all those media files etc. Well, they could just have screws for the back so you can remove it. Similar to the Mac Book Pros. Then you could keep all the proper passage ways for air flow and still be able to get to the hard drive and/or dvd drive. I suspect there will be some after market solution for this issue. I’d be willing to bet that probably less than 1% of the consumers that buy iMacs care whether they can change the drive or not. I wasn’t aware that if you wanted Apple to put a larger drive in down the road, they wouldn’t do it. That doesn’t seem fair at all. My thinking on the drive situation is that since I always have a partitioned hard drive connected externally, I would set it up as the boot drive and let the external drive do most of the workload. That’s one thing I loved about my G4 dualie MDD with four drive bays. I’d replace one or two every time capacity went up and prices went down for drives. Apple really doesn’t want any messing around in the iMac and with this drive issue, they’ll be even less tinkerers trying to gain access since they’ll have even less need to go poking around inside. That’s the Apple way, I suppose. I’m still going to get a new iMac even though I know what to expect since you pointed this issue out. I’ll go with the standard 1 TB drive since I keep most stored data on external drives. And the whining about the size of the internal HDD is easily resolved by adding an external – if the whiners are half as adept as they pretend to be, they can sort a useful, simple configuration. @Laughing_Boy48 – you’re right that most people won’t bother with upgrading their drive. I might be unusual in that I upgrade the drives on my laptops fairly often. The drives are relatively cheap and it’s easy to do. Replacing the drive on the iMac has always been harder, but now it’s all but impossible. There is also the nagging issue of longevity to consider. It is not always about replacing a drive when it fails, but upgrade a component to make that machine usable longer. An external drive is an alternative, but I would agree that some way to replace this with aftermarket parts is preferable. The same thing goes for memory (though there is an access panel for the iMac for this component), it is a fairly easy and cheap way to increase performance later in a machines life. Doesn’t anyone at Apple realize that one reason laptop sales are ahead of desktops is that Apple doesn’t make the sort of desktop many of us want? The MacPro is too big, too expensive and unnecessarily powerful. The iMac is a pretty face with an empty personality. It’s a pain to fix or upgrade and this revision makes that even worse. That is why I’m sticking with my white iMac. At least, if it breaks I can fix it with stock parts. I suspect I’m not alone. Apple’s losing sales because people are either not upgrading or deciding to make a laptop do double duty rather than buy an iMac that doesn’t fit their needs. very funny. iMac sales are blowing through the roof. Especially after the aluminum unibody redesign. Use an external HDD as the boot up.